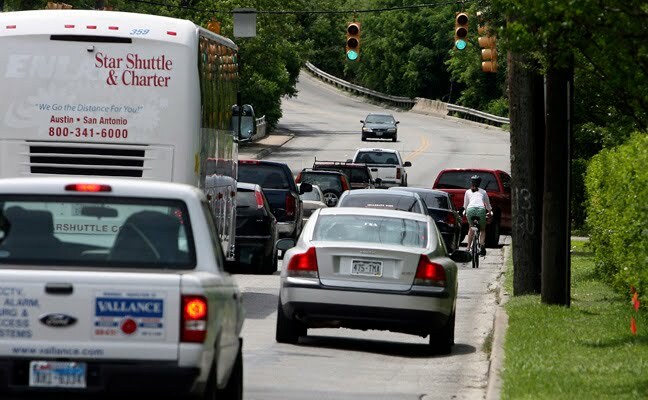 San Antonio is looking to improve its roadways to accommodate bicyclists. San Antonio and Bexar County could add 350 miles of bike lanes just by restriping pavement, without impeding traffic or widening roads. Kudos to them. Although, I don't know that I would feel all that safe with just having streets restriped. If bike lanes were going to be added here, I would want a considerable amount of space dedicated to bikes. Locally, I like to use the bike trails that the City of Laredo has provided for us. People refer to them as sidewalks. And I do that only because of the safety factor. I have more peace of mind when I'm riding on a separate plane from that of car traffic. But as Que Fregados has documented, sidewalks can present their own set of limitations. I've used the sidewalk along Chihuahua street to access the downtown area. Apart from a bus bench, or light poles, or the occassional detour sign blocking the sidewalk, it's a pretty easy and safe way to get from one point to the other. Making these sites more wheelchair-accessible would be of great benefit. On a bike, you can easily jump the curb. But that depends greatly with how agile you are with your ride. This video makes the case for having bike lanes separated from roadways. You want lanes that are safe enough for kids to ride on.